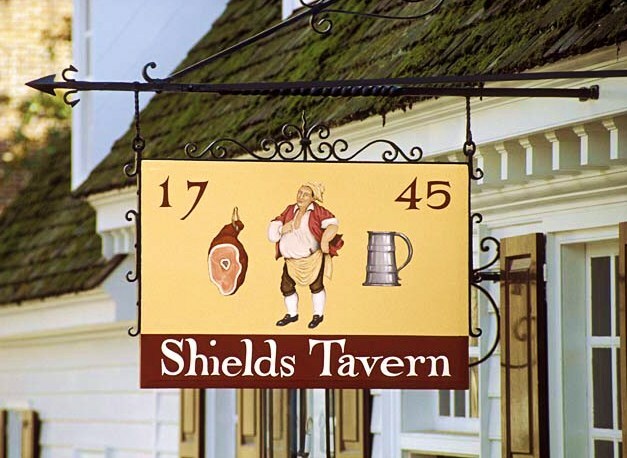 Tonight we enjoyed delicious cocktails and fortifying cuisine at a wonderful historical curiosity, Shields Tavern in Colonial Williamsburg, Virginia. We perused the list of seven “fortified drinks,” what colonial Americans called cocktails. We tried a “rummer,” an 18th century favorite with dark rum, apricot & peach brandies and crushed ice, then garnished with a cherry and slice of lime. Fortifying, indeed. Next we tried an Old Stitch, a beer brewed exclusively for the Colonial Williamsburg taverns from a 1737 recipe. Back in the day it was known as a “strong ale.” Today it’s best described as a cross between a porter and an amber – the common label “brown ale” doesn’t do it justice. It’s a very dark-colored, unique brew, with a toffee smell and very malty taste. If you’re a fan of dark beer, don’t miss Old Stitch the next time you’re in an historic tavern in Williamsburg. About Williamsburg … The town of Williamsburg, population less than two thousand, became the capital of Virginia in 1699, rising out of a small community known as Middle Plantation. Williamsburg was the political and social center of the colony until 1780, when the capitol was moved to Richmond for security reasons. In the early 1920’s John D. Rockefeller bought the town and in 1926 work began to return it to its 18th century identity. Over 700 buildings that post-dated 1790 were razed. Today Colonial Williamsburg is basically a huge outdoor (and indoor) museum, a step back in time open to the public 365 days a year (and very close to Busch Gardens).